Although most of my 009 stock moved out of my parents’ house with me a decade ago, I only finally got around to “clearing up” the remaining railway stuff at Christmas. 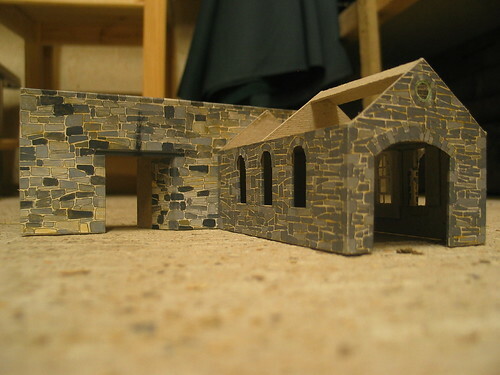 Among the 00 gauge ready-to-run (which I am considering recycling into a 5.5mm scale narrow gauge project) and Superquick buildings was this half-built 009 engine shed which probably dates from around 1994 when I was planning an end-to-end layout to replace my first tail-chasing “train set”. It’s constructed of thick card with painted paper overlays, and the one completed window is clear plastic with a delicate paper frame. At the rear it abuts an overbridge which features a lintel beam from plastic section and a soot mark. I’m not certain why construction ceased all those years ago, in fact I had completely forgotten about its existence until I found it again, but if I was still modelling a Welsh railway it might have proved a handy shortcut. As it stands the sum total of my work on Fairlight over the Christmas period has been a few more wiring joints soldered and some more ballast laid. But I am at least making progress again even if I can only spare an hour or two a week at the moment! 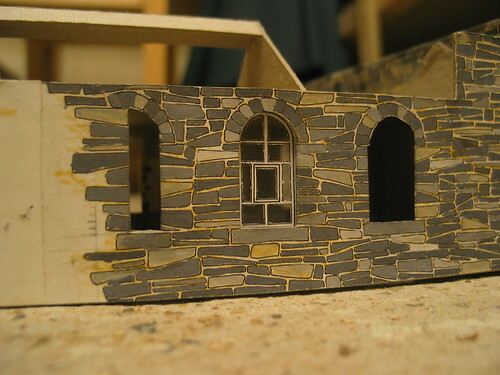 This entry was posted in 009, model railways, narrow gauge, old, scratchbuilt. Bookmark the permalink.